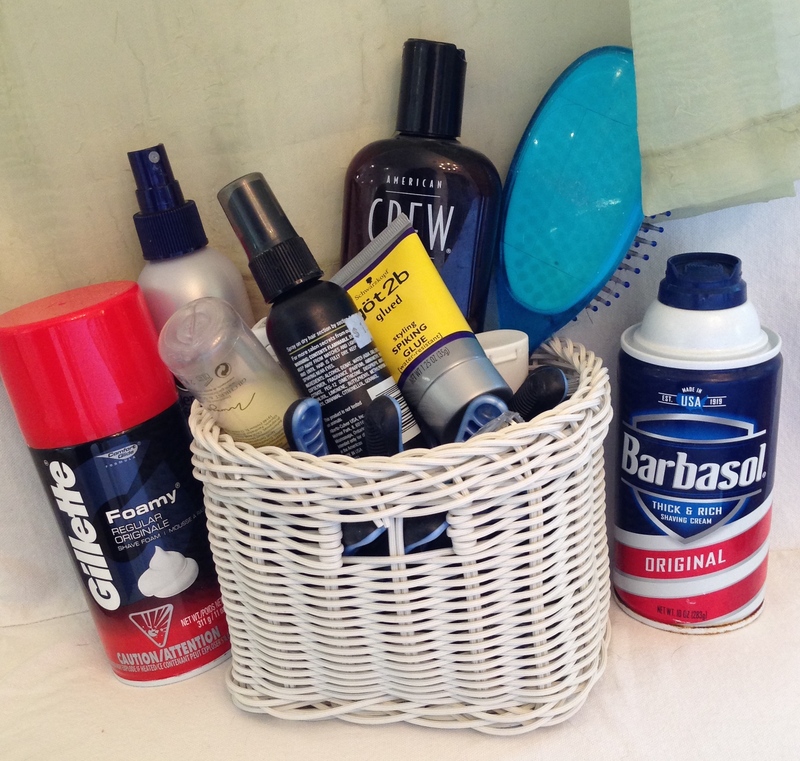 Just one of Andy’s grooming baskets. But here’s the thing — I’ve got an issue with one of the reasons that keeps showing up. Buzzfeed’s #10, to be exact. The one about how Asian men are awesome because of their smooth, nearly hairless skin. Don’t get me wrong. Such a trait would definitely belong on a list. The perks are obvious: buy fewer vacuum cleaner bags, spit out less hair during certain bedroom activities. That’s a partial definition of domestic bliss, right there. No, I have another issue. After Andy showers, the bathtub looks like a trio of German Shepherds partied there for a week. He’s spent $500 to pay plumbers to unclog said bathtub – just this year. Andy can – and does — grow a beard during a vacation lasting more than three days. In short, people, do not be fooled. Dating an Asian guy is NOT a guarantee of lots of lovely, smooth, silky, hairless skin. And guess what? If there’s an exception for #10, there’s probably an exception for #1-9 and #11-17. You’ll simply have to date lots of Asian guys – and lots of other guys – and figure out what you can live with, and what you can’t. There are no shortcuts. But trust me, if a guy can cook like Andy (Buzzfeed’s #5), you won’t mind vacuuming the bathtub. 1. I didn’t know that was a thing…going for Asian males for smooth, nearly hairless skin. 2. For the 100th time, the problem with the plumbing is tree roots! 3. My beard was awesome. 5. You would think traveling with a white girl would work. Also, see #3. 6. It’s not a ‘fro. It’s the prosperity perm, without the perm. Asians covet my hair, babe. 8. Huh. Is that why we don’t do that anymore? Bring me a razor! *Andy says 8 became known as an auspicious number because “baht” or “eight” sounds like “faht” or “good” in Cantonese. You may remember that the Beijing Olympics started on 8/8/08. Andy’s mother remembered. Andy’s mother insisted on eight bridesmaids at our wedding. Also eight groomsmen. But that’s another post. ahahaha kudos to you for this post. Noted, not all Asian men have smooth skin 😉 Thank you for mentioning my post! Hilarious and a tad disgusting. I only have experience with one Chinese man and he’s, more or less, a hairless wonder. I love it! But I know some of my friends dig hairy guys. After reading your list, I definitely don’t see the appeal. BTW, the Beijing Olympics were on 08/08/08 with the opening ceremony starting at 8:08pm (if memory serves me correctly). That’s quintruply lucky. Nope, you are right! It was 2008…it just doesn’t seem like it was 7 years ago — those were the most amazing opening ceremonies ever. London was 2012. Thanks for catching the error. I fixed the post! 2. For the 100th time, tree roots! 8. Huh. Is that why we don’t do that anymore? Thankfully as a white guy with a (half) Asian wife, the smooth skin is true the other way round, and I’m pleased about that!! #8 Had me laughing out loud. Love it! Don’t laugh too hard until next week, after the baby is due! My Chinese husband was medium-hairy; he grew a wild beard; and his hair was naturally wavy. Yeah, that sounds very, very familiar. Was he Cantonese, by any chance? Nope. He was from Fujian (Xiamen). He also had a Mongolian grandmother and another grandmother with some Spanish blood via the Philippines. Of course, all Chinese are 100% Han. Right? Aw man I wish Michael could grow a beard. I love men with facial hair but Michaels family is the group of Asian males that are pretty much hairless. He even cuts his hair to almost shaved because he’s balding :(. All other men in the family have that gorgeous thick Chinese hair though…sigh. Yeah. I’d shave my head if I looked like Charlize Theron does without hair. Hair is an expensive pain. I hate beards. I hate scruff. I’d give Andy’s hair to Mr. Panda if I could!!!! I will pass this info along to Andy. He is in charge of clogs! Haha my Chinese fiance is also very hairy – his mother claims it’s because she fed him too much dairy as a child. Go figure! Andy’s mom said something about his size and hair being the result of all the noodles she ate while pregnant. In vain do I mention recent studies about genetics.